Walt Disney had a passion for the animal world, as is evident in his creation of the True Life Adventure Series. When EPCOT Center unveiled The Living Seas and, later, when the fourth gate of Walt Disney World was opened, Disney’s Animal Kingdom, it was clear that these vast landscapes of earth and sea were guided by the love Walt had for the natural world. The creation of a conservation fund to spread education and preservation worldwide also had the touch of Walt in it. This week, several environmental events around Walt Disney World were announced, and once again you can see the guiding hand of Walt. With Pollinator Day, guests of all ages can learn about how pollinators, such as bees and butterflies, assist in the cultivation of plants used in everything from medicine and fibers to delicious sweets and spices. Not only will guests be able to see pollinators in action, they can also gather the tools needed to create their own pollinator garden. As if there weren’t enough happenings taking place in The Seas on a daily basis, on World Oceans Day sharks, marine mammals, ocean play, sea turtles, and coral reefs are each going to be given a special spotlight. As an educator, I understand the value of learning through paly and the creation, or stumbling upon of, teachable moments. Walt Disney understood these ideals and crafted worlds of edutainment, or the combination of education and entertainment. The same principles built EPCOT Center and are the foundation of Disney’s Animal Kingdom. For any event focusing in on the natural world, like those coming down the line in the next several months, the lessons have to be injected with a bit of wonder and a pinch of mirth in order to seal that connection and make the message stick. From the looks of things, that is precisely what the wonderful animal ambassadors at Walt Disney World are doing! Walt Disney can make no new speeches or appeals to the world from the corner of his desk, beckoning us to come along with him and help shape a brighter tomorrow for all of the creatures of our planet. The good news is he doesn’t have to. The ideals he left us with his legacy continue on and have found new paths to exploration and education. I think he would be excited to see the happenings taking place at Walt Disney World between now and October, I know I sure am! 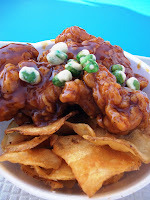 As far as ranking the food of the various parks of Walt Disney World, the Magic Kingdom seems to be the most generic. We all have fond memories of meals from our childhood there, but over the past several decades, the menus have become less and less adventurous and more basic burgers and hot dogs. This movement has, for all the best reasons, begun to slow and turn around. Unique items, such as the Citrus Swirl, are returning to menu boards across the parks and fresh ideas, including the Broccoli Peppercorn Salad, are popping up from Frontierland to Tomorrowland. One innovative meal coming out of Fantasyland are the Teriyaki Nuggets found at the Friar’s Nook in Fantasyland. This may sound like your typical carton of nuggets, tossed in a sweet and tangy teriyaki sauce, but it goes much further than that. The base of this entree starts with a generous portion of the handmade chips that have been popping up at restaurants around Walt Disney World. These thick cut chips resemble a kettle chip, a tiny ring of potato peel along the edge and a robust crunch coming from the actual chip. Next come the nuggets, the variety served at a majority of quick service eateries, smothered in a tangy teriyaki sauce. They are juicy and the batter tends to soften a bit under the sauce. While they may be a gussied up version of the generic nuggets, they are still mighty tasty. The crowning garnish of this dish, however, is the wasabi peas that are sprinkled atop the nuggets. I’m not a big fan of peas, but I am a huge fan of wasabi. This adds a bit of heat to the nuggets and a flavor spectrum lost throughout most of the Magic Kingdom. There are a lot of elements to this incarnation of the nuggets that come with a satisfying crunch, but it is that fact that this dish is a little more outside the box than we have seen from the Magic Kingdom that makes me love it. This dish will kick your taste buds and not be sorry about it, which means that it is not for everyone. However, if you are bold enough to take a little dare for your lunch, the Teriyaki Nuggets could be the lunch for you! Walt Disney World is home to the largest active costuming shop anywhere on the globe. Every Cast Member who could be seen by a guest, from maintenance to Cinderella herself, has a costume to wear. These costumes need to be cleaned, repaired, and readied for the next time a Cast Member needs to don their outfit for their role in the show that is Walt Disney World. 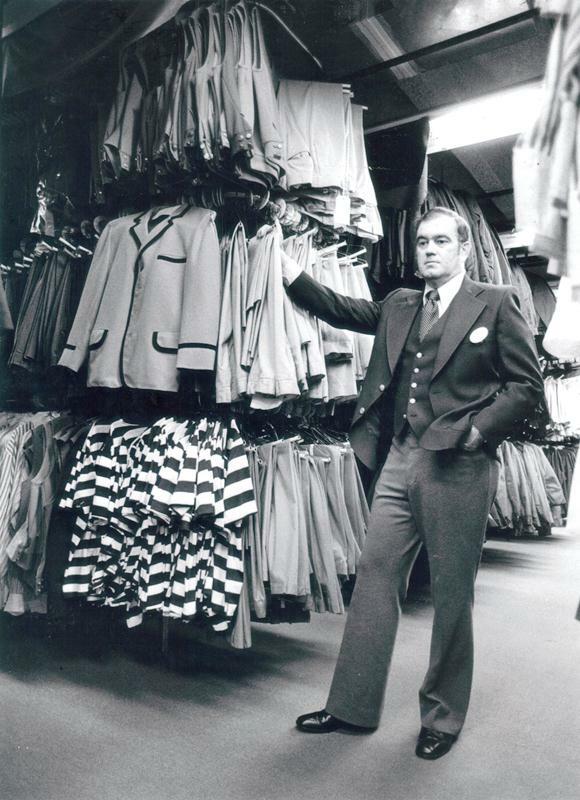 This picture features one of Walt Disney World’s original costume managers, Ken Creekmore. While Ken has his place in history reserved with his representation on one of Main Street, U.S.A.’s famous windows, he is seen here in one of the costuming storehouses in 1978. Many of those in the costuming department came, and continue to come, from a background in the motion picture field. 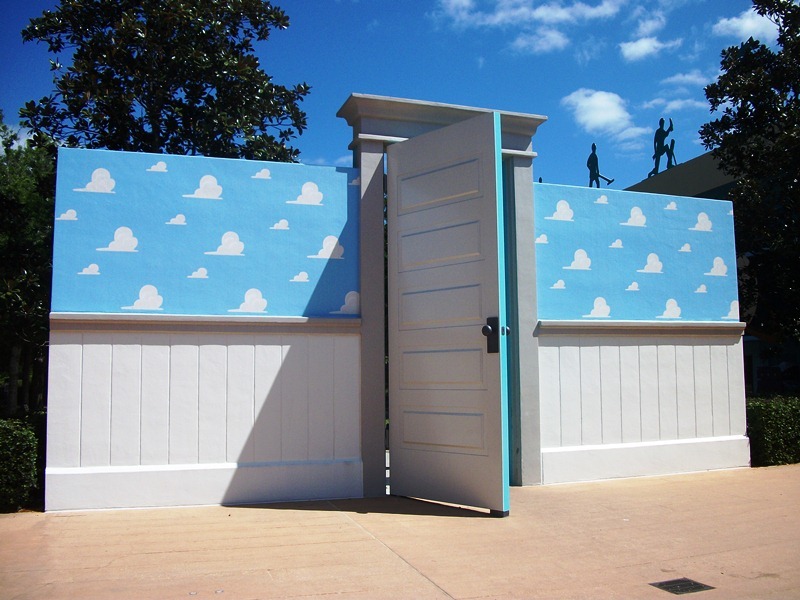 This film background lends itself to the realistic environments that have been crafted for the parks and resorts of Walt Disney World. The detail I love most in this picture isn’t the stylish three piece suit Creekmore is rocking, it is the costumes themselves. Specifically, the rows and rows of costumes that while different in size are, for all intents and purposes, identical. For the most part, it’s been getting quite warm around the country the past couple of weeks and Walt Disney World is no exception. In fact, as we move into summer, any excuse to step into an air-conditioned attraction, shop, or activity will be a perfectly valid one. The ability to find ways to get wet and cool off will also be at a premium. But you don’t have to stand in a queue at Splash Mountain or Kali River Rapids for over an hour for a brief burst of water! The roundtable has gotten together to talk about some of our favorite ways to get wet in Walt Disney World! 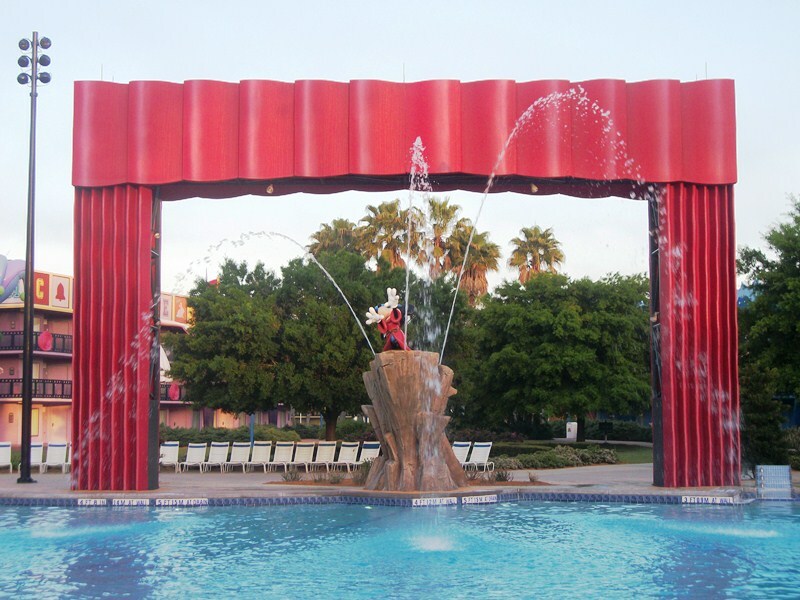 Roundtable Topic: What is your favorite place for some Walt Disney World waterplay and why? Roundtable Contributors: Elizabeth Caran (Take the Monorail), AJ Wolfe (The Disney Food Blog), and yours truly. Elizabeth – I always want to go to a water park when I am at WDW, but invariably the weather is bad or I get distracted by some other temptation. So I've actually only been just once! 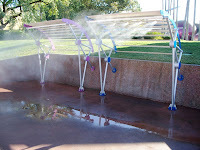 But we do find great water play places for the kids all over the parks and frequently pack a towel for those moments the kids have just GOTTA get wet. 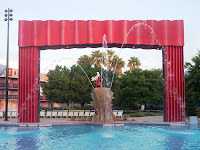 They pretty much love any water feature in any park, but their favorite is the fountain at Downtown Disney. We have a tradition when we drive down to Walt Disney World. Instead of hitting a park when we arrive in the late afternoon, we pack up and head to Downtown Disney for some Earl of Sandwich and a dance party. Plus, of course, a fountain run. It's a great way to let out some steam after ten hours in the car. AJ – For years my answer to a question about the best place for watery fun in Walt Disney World would have been Typhoon Lagoon. Lazy River? Check. Shark Reef? Check (just remember to get there SUPER early so that you can go through more slowly before the line builds up). Crush n Gusher slides named after tropical fruits? Check. Wave pool? Check. But these days my allegiances have switched a bit. My top spot for cooling off is the good ol' hotel pool. Yep! And not just any time, either. Morning. Early morning, to be exact. Being from the Northeast originally, the only times of the year that I could swim growing up (assuming I had any sort of water or pool at my disposal) was for about two months during the summer, and while we were on vacation somewhere warmer. Nowadays, when I'm in Florida or California at a Disney hotel, one of my favorite parts of the day is being the first one in the pool in the morning -- even if only for a few minutes. Before the hordes come to claim their pool chairs and before the theme park lines start forming in earnest, I hit the pool to watch the morning begin. Ryan – My favorite way to get wet at Walt Disney World? It’s real simple, the benches found in Epcot’s Future World that come complete with misting stations. The misting is nice and cool, but you’re not going to get soaked sitting there. Also, it’s relaxing, you aren’t standing in a line or climbing stairs to get to the water, you’re just sitting and resting. The only real drawback to the misting stations is the fact that I can’t see out of my glasses until I get up and clean them off. 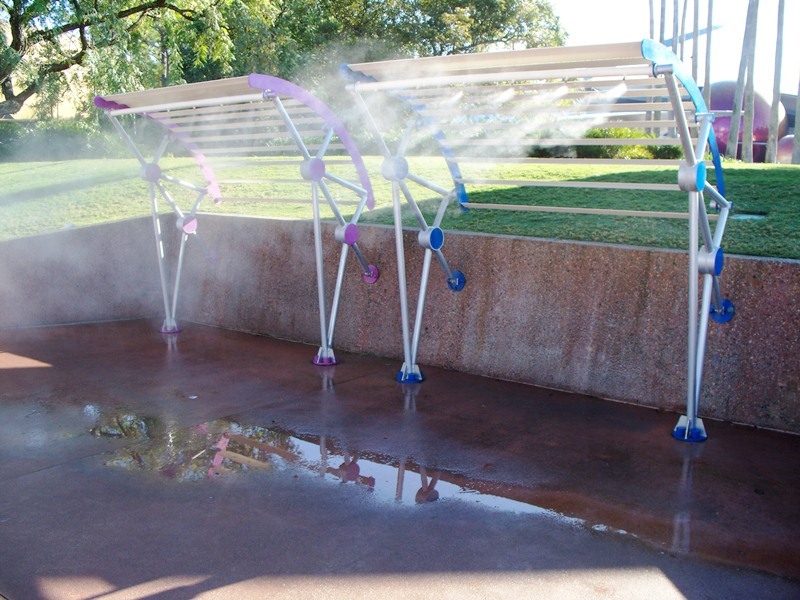 For those who want to exert some energy with their waterplay, Epcot has plenty of other ways to get wet! From the jumping fountains of Imagination to several water zones with rubber flooring and spraying fountains, Epcot has an option for everyone seeking to cool off from the sweltering Florida sun. There you have it, just a few ideas on how to stay cool this summer when you visit Walt Disney World! But there are plenty of other ways to beat the heat, and we’d love to hear how you get wet when visiting the Vacation Kingdom! Having spent many an hour there myself, I was extremely pleased to see Richard Terpstra tapping into the House of Magic for his latest DesignerLand shirt design! Estelle Hallick takes the bugs to Broadway when she compares posters from It’s Tough To Be A Bug to their musical counterparts at This Happy Place. Christopher Robin’s bedroom is toured by Melissa Loflin of Makin’ Memories, and I’m already in love with this corner of the UK! Sarah Holodick discusses the importance of consistent dishes and food preparation in Walt Disney World at Eating WDW. The 2012 International Food and Wine Festival is just around the corner, and AJ Wolfe has you covered at The Disney Food Blog with her tips for getting ready! Jeremy Morrison really makes me want to go back and repeat high school, but only if I can attend at the Millennium Falcon Senior High School, also known as Parkland High School, as seen at Spins This World. Walt’s earliest beginnings in Hollywood are summed up in a single detail at Disney’s Hollywood Studios, and Studios Central and Matt Hochberg are there to tell the tale. Mitch goes in search of spots where Walt Disney was photographed in Disneyland and discovers what these spaces look like today for Imagineering Disney. In one of the cooler photographs I’ve seen recently, Matt Stroshane captures the launch of the SpaceX rocket as it soars behind Mission:SPACE at the Disney Parks Blog. D.J. Jones gives a little insight into his personal challenge at the Expedition Everest Challenge in The World of Deej. The waiting area for Voyage of The Little Mermaid at Disney’s Hollywood Studios is littered with some fantastic maritime memorabilia. Are these items that Ariel herself has accumulated in her quest to be part of our world? Or are they donated pieces, like the artifacts of the west that reside at Pecos Bill Tall Tale Inn & Cafe? No matter where the objects come from, they show off the best of the sea, and today we’re walking a mile in the shoe, err, rather leg, of one of the seas’ most famous ne’er do wells. 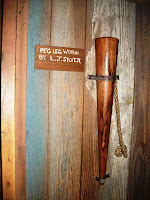 This leg is listed as once belonging to L.J. Silver, an obvious nod to Long John Silver. Silver is the quartermaster in Robert Louis Stevenson’s Treasure Island. In the novel, the peg-legged Silver spins fanciful tales about his life to enamor the young hero, Jim Hawkins. His pirate stripes are soon revealed, mutiny ensues, pirate battles ramp up, treasure is lost and then found, and, in the end, Silver’s escape is facilitated and he lives to plunder another day. I wouldn’t imagine that Long John Silver would bequeath his leg to Ariel when he sinks down to Davy Jones’ Locker, but I could foresee him needing a replacement leg. After replacing the wooden leg, and hopefully naming it Smith, I imagine Silver would simply toss the unneeded limp overboard. Where, once upon a time, Ariel found the leg and added it to her collection. Last week the Kim Possible World Showcase Adventure ran its last mission in order to make way for Phineas and Ferb: Agent P’s World Showcase Adventure. As a fan of Phineas and Ferb, seeing an attraction featuring the silent platypus secret agent is terrific, but I have a few reservations. For starters, I’m fairly certain this is simply an overlay and not a truly new experience. Try thinking of this like it’s a small world in Disneyland, when it puts on its holiday garb it isn’t a new story, just a tweaked one. Instead of a Kimmunicator guest will utilize a Field Operative Notification Equipment (F.O.N.E. ), but there are still phones being used as storytelling devices for the attraction. In the place of Professor Dementor we are given Dr. Doofenshmirtz, but it is still a girlish clock figurine chasing the villain around the clock tower in Germany. What feels like a very real possibility here is that Kim, her sidekicks and rogues gallery, have simply been transmogrified into characters from the Organization Without a Cool Acronym (O.W.C.A.). Since the opening of the Kim Possible World Showcase Adventure there have been ample ideas and creative uses offered up as the next steps for this type of attraction, along with the hopes that it would find a home in a variety of Walt Disney World corners. We see the fruits of the investment in interactive attractions in the Sorcerers of the Magic Kingdom and the success of the Kim Possible World Showcase Adventure. The living artwork of Sorcerers and the integration of setting in both Kim Possible and Sorcerers give Agent P’s World Showcase Adventures a strong foundation, but I fear that the lessons learned are not going to be applied here, they are simply going to be copied. What Kim Possible lacked was new source content or, in other words, the attraction launched too late to take advantage of the success of the Kim Possible cartoon. Thankfully, Phineas and Ferb is still going strong, and the clamoring for the inventive brothers and their secret agent pet is at an all-time high. This gives Agent P’s World Showcase Adventure the possibility of continuing on and having many secret missions in Walt Disney World for many, many years. I am hopeful that after the initial conversion of the current adventures in World Showcase that Agent P will also be assigned to the pavilions that haven’t been explored yet. While I am afraid that we are just dressing up Kim Possible’s previous missions, I will be the first one to pick up the F.O.N.E. and assist Agent P against the –inators of Dr. Doofenshmirtz! When you head to the crossroads of Epcot, which would be where the promenade meets the International Gateway at the United Kingdom pavilion, you have a choice between having an entire meal in a glass or an entire meal on a bun. While Guinness is the beverage of choice in this corner of World Showcase, we’re focusing in on the pub fare from the Rose & Crown Pub. The main dishes on the menu include Fish and Chips, Scotch Eggs, a Corned Beef Sandwich and today’s bit of grub, the English Bulldog. 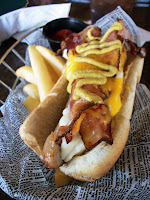 The description of the dish is enough to make your brain burst: Split Banger stuffed with Mashed Potatoes, Chopped Bacon, Irish Cheddar, and a Spicy Mustard Sauce. Oh, and it also comes with a fair serving of thick-cut fries. None of the components in this sandwich could be considered on the skimpy side. The banger is full of flavors and has a great snap to the casing. The bacon is very thick and it adds a satisfying crunch, a smidge of fat, and burned bits for flavor and texture. The creamy mashed potatoes are a terrific way to hold everything together in the English Bulldog. As if the sandwich needed more salt, the cheddar finds a way to be strong, but not overwhelming. 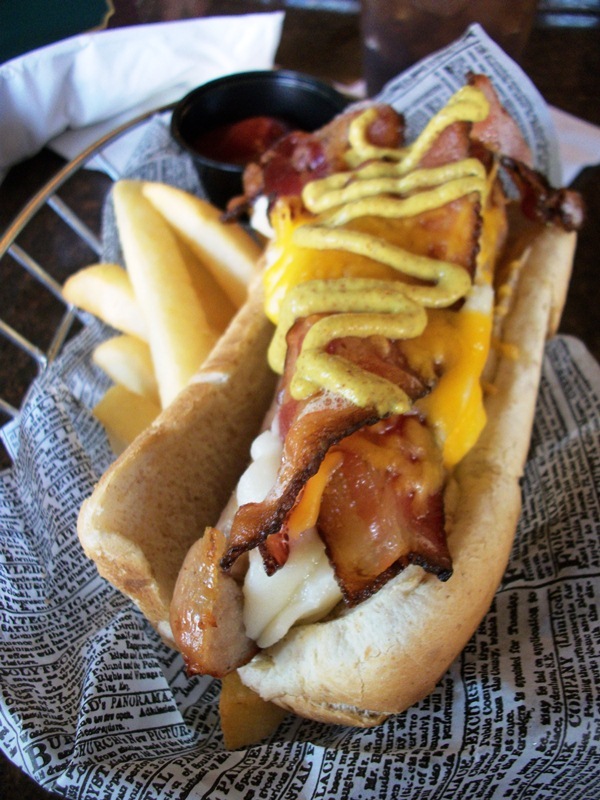 Last, but not least, the Bulldog gets its bite from the spicy brown mustard that tops this mammoth mouthful. The Rose & Crown Pub may be known for its selection of brews from the United Kingdom, but its selection of pub favorites are there for more than just sopping up excess beverage. Delicious and nowhere near good for you, the English Bulldog is an almost perfect vacation meal!